My review of “Clara’s Wish” by Beth Shriver | Stop #12 of my Salute to Christmas Reads! There seems to be quite a bit of disagreement about this book… most people love it but at least two reviews I’ve read were clearly not impressed. I think a good part of the problem with some judgments might be similar to what we see from fans of historical fiction – readers who are familiar with one specific community expect every book to be the same and that’s just not how it works. Personally, I think the book is written as well as the last book of Beth Shriver’s I read. No, every Amish fiction story is not the same. Life would be awfully boring if that were the case – but Beth Shriver writes an interesting story about Clara and the community she is a part of. 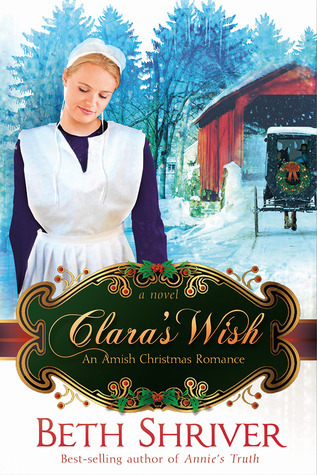 Clara’s Wish is a heartwarming Christmas read and a sweet story about friends coming together to give a wonderful gift to a dear friend. Lizzy Ryder is looking for an upstanding, hard-working, God-fearing gentleman—everything that Zachariah Schrock is not! But when Zach’s sister and Lizzy’s best friend, Clara, takes ill, they come together to give her a Christmas she’ll never forget. As Clara’s condition worsens, will they learn to lean on God and each other? < Previous My review of “Love at Mistletoe Inn” by Cindy Kirk | Stop #11 of my Salute to Christmas Reads! Next > My review of “The Wishing Season” by Denise Hunter | Stop #13 of my Salute to Christmas Reads!